Without wishing to set a precedent, we are going to start for the last part of the title of this entry. Since 2011, on the first Thursday of August people all around the globe celebrate IPA Day, an event that, with the India Pale Ale style as a flagship, intends to serve as a celebration of the craft beer movement. From then on, multiple events have been organized through these years to celebrate it. Among them, those organized by the ACCE (Spanish Homebrewers Association), that since last year consist in three simultaneous activities: exchange of IPAs between members, a selfie contest and a homebrew competition (of IPAs, of course). 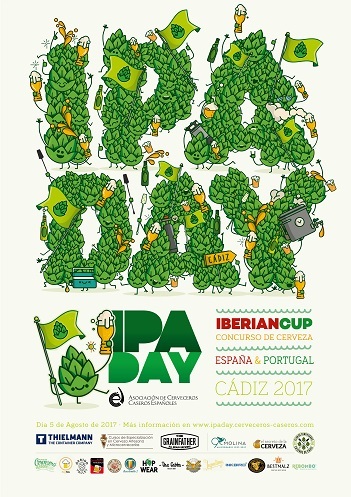 Although it may seem odd after all these years of homebrewing, we have not entered our beers to any competition, but this Iberian Cup looked like the perfect event to finally do it. To do this we just brewed an American IPA, a version of an older recipe that will be the subject of a future post. However, and here we go with the first part of the title of this entry, a couple of months ago we succumbed to the temptation of brewing one of the trendy styles of the moment, a New England IPA or NEIPA. This new sytle is going to be the guest star, so thanks to that, homebrewers are able to enter an additional beer for this category of NEIPAs. As we had already brewed it (and tasted) we will send some bottles for this special category, knowing beforehand that our beer probably has lost some aromas due to oxidation issues because of the time passed. NEIPAs are said to come originally form New England (in the northeast of USA), hence their name. You can read some of the characteristics of the style in the website for the competition (in Spanish). In short, there are some kind of IPAs in which bitterness is not so prominent and aromas and flavors from tropical and fruity hops are the stars of the show. They also are recognizable by their cloudy appearance and their smooth and creamy mouthfeel. To get all of these attributes, we did some research focusing in some homebrewers that had been brewing NEIPAs for some time. We revised some notes for a talk about this style by Scott Janish, the forum of The Electric Brewery and their Electric Hop Candy and the post about the clone of Tired Hands HopHands in Ales of the Riverwards. Once we reviewed all of these we came to the conclusion that there were some key points to achieve the peculiar characteristics of the style. To see these key points we will be describing them taking into account the different ingredients for this beer. First of all the grain; although hops will have the leading role, a good pale malt that imparts some flavor is a great choice as base malt. 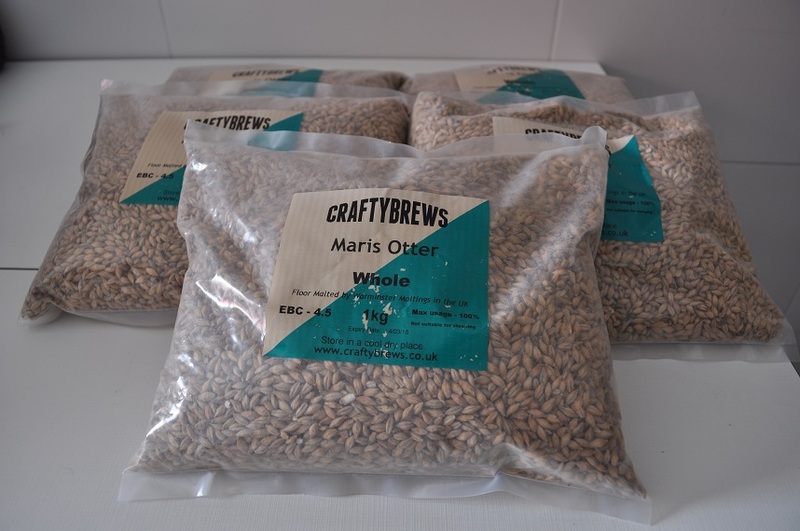 English malts like Maris Otter or Golden Promise could be a good option. Apart from the base malt, the addition of protein rich adjuncts, like wheat (malted or flaked) or, especially, oats (flaked) could be the key to get that creamy mouthfeel typical of NEIPAs. It appears that a good start point would be a percentage of about 15-20% of these adjuncts. If using crystal malts, you better keep them in a low proportion (around 5-6%). Let’s follow with the star of the show, hops. We found that to get the aroma and flavor we are looking for, we must chose combinations of varieties such as Citra, Mosaic, Galaxy, Amarillo,… or any other variety that can impart some tropical aroma and/or flavor. As we said before, bitterness is in the background, so IBUs shoudn’t go too high. Also, almost everybody agrees that, if not all, most of the IBUs must come from post-boil additions, in the whirlpool. Apart from these additions, what really seems to make a difference for this style is dry hopping and the way to do it. Unlike other hop forward styles, where dry hop charges are added after fermentation is finished, with NEIPAs it is recommended to add the first dry hop charge when fermentation is still active. Some people say they add the first charge of dry hops 24-48 hours after the beginning of the fermentation, while other people even go as far as adding hops right after pitching yeast. What initially could be seen as something against what we had previously been told, that CO2 from fermentation could carry some volatile compounds out of the fermenter, appears to be useful because it seems that yeast can interact during fermentation with some hop compounds and transform them into some others that can contribute flavor and aroma. In many sites this is defined as biotransformation, but the truth is it is still in some kind of scientific limbo and the proper processes are not really known. While we wait for science to shed some light about these processes, we will give a try since it appears the final result is worth the effort. If we talk about the yeast, some strains are more prone to produce this biotransformation we talked about than others. In particular, the strain nicknamed Conan, also known as Vermont Ale or Vermont IPA, and London Ale III 1318 from Wyest are the most popular strains for NEIPAs, with some room for other English strains. In the case of dry yeasts, it is a matter of trying, because nowadays there is not an equivalent of the strains mentioned above. Finally, we are going to talk about something that a lot of people don’t really pay too much attention to, and that in the case of NEIPAs it appears to be of importance, and that is brewing water. Here, the key point to be taken into account seems to be the sulfate:chloride ratio. Whereas for classic American IPAs is usual to favor sulfate over chloride to promote bitterness and dryness, in this case chloride prevails over sulfate, with typical ratios of 2:1 or at least 1:1. With all of these theoretical data collected, we started to plan our recipe, even with the mineral content of our water, being the first time we were going to treat it since we started brewing. (it was about time). Our first idea was to use a greater percentage of flaked oats and keep wheat flakes apart, but sometimes your stock gives you a surprise, so we had to improvise and compensate our lack of oats with flaked wheat. In the end, flakes (oats and wheat) were a 14% of the total grain bill. You can also see that we added some Munich I malt, a malt we love, and we think it imparts a special touch to complement our base malt. A separate chapter is needed for brewing water. For our first time treating our water we went with Bru’n Water, the spreadsheet designed by Martin Brungard, a water expert and also a fellow homebrewer. Although at first glance this spreadsheet could seem overwhelming, reading the instructions and watching a couple of video tutorials, its use is not as difficult as it may seem initially. First we did in the morning of the brewday was to boil the water we were going to use to eliminate chlorine. This is possible because in our area water is treated with chlorine. In other areas where water is treated with chloramines, this is not so easy and it usually calls for some type of filter. For our water profile, we went for a sulfate:chloride ratio of 1:1. To do that, to our source water (checking the most recent analysis we could find), we added 6.4 g (0.23 oz) of CaCl2 and 4.2 g (0.15 oz) of CaSO4. To round everything, we added about 38 mL of sulfuric acid 1 N to adjust the mash pH to a theoretical value of 5.48 as calculated by Bru’n Water. 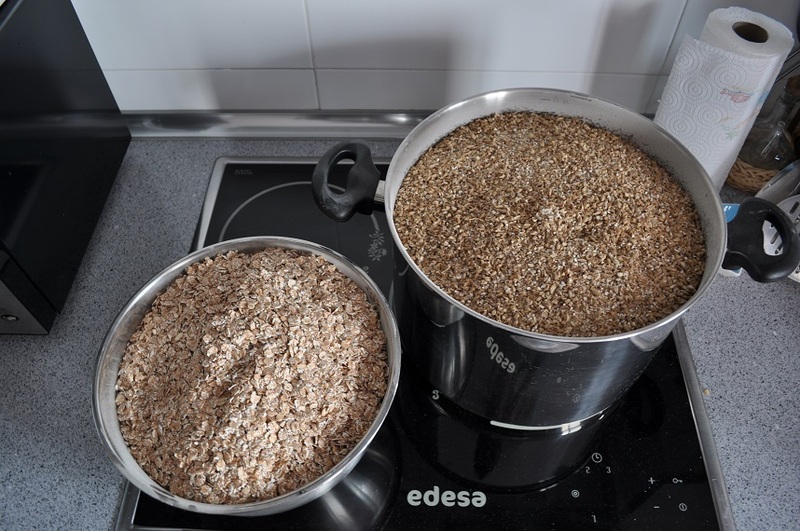 The brewing process was quite similar to the one we had previously planned, with the mash at about 67ºC-70ºC (152.6ºF-158.0ºF) for one hour. During this time we took a sample from the wort and cool it to read pH. The result, 5.41, not far from what Bru’n Water had predicted. After mashing out, we remove our grain bag (a brand new one from The Brew Bag) and added Chinook hops while we were heating the wort. We have some experience with first wort hopping and, since the results were satisfactory, we decided to do it again for this brew. We boiled for 60 minutes and remove the kettle. When wort was at about 90ºC-92ºC (194.0ºF-197.6ºF) we added whirlpool hops (Citra, Galaxy and Mosaic), each of them in a mesh bag. We left it that way for 15 minutes and then we cool the wort with a cooper immersion chiller as soon as we could until we the wort reached 24ºC (75.2ºF). We transferred the wort to our Brew Bucket from SS Brewing splashing it to try to oxygenate as much as we could and put the fermenter on a little fridge to cool the wort a little more before pitching yeast, that we had taken from the fridge a while ago so it could be at room temperature. We also take a read of the original gravity, 1.058, practically the same as the one predicted in Beersmith. We cleaned all the mess while the wort was cooling down and when it reached 20ºC (68.0ºF) we pitched a pack of Vermont IPA from Giga Yeast. This packs are supposed to have over 200 billion yeast cells and can be pitched directly, so that’s what we did. We set the fridge at 18ºC (64.4ºF), that way fermentation would be at about 20ºC (68.0ºF). 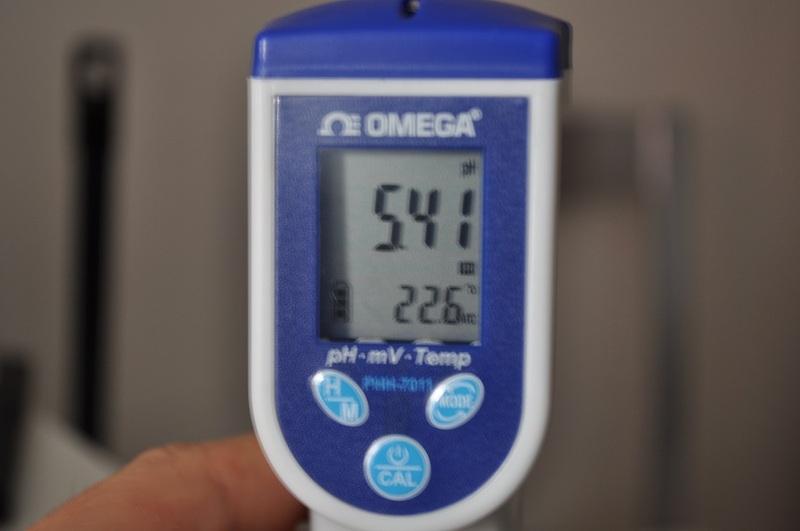 During the days fermentation was active we kept adjusting the temperature of the fermentation chamber so the beer was always between 20ºC-21ºC (68.0ºF-69.8ºF). Before the first 24 hours the airlock activity was clearly visible, the yeast had started fast. After 48 hours from pitching, with fermentation very active, we added the first dry hop charge (Citra, Galaxy and Mosaic) with our also brand new dry hopper. Form the third day onwards the airlock slowed its bubbling and, on the sixth day, we remove the dry hopper (sanitizing with star san when opening the lid) and, after cleaning it, we added the second dry hop charge. This time, only Galaxy and Mosaic. Four days later, we remove the dry hopper with the hops and divided the full volume in two PET demijohns (about 19.5 liters, 5.15 gallons, of beer). Three days after this we cooled one of the demijohns at 7ºC (44.6ºF) for kegging and force carbonating in a small corny keg of 9.5 liters (2.5 gallons) and we bottled the beer from the other demijohn. Final gravity was 1.015, a little bit higher than expected. Final result, a corny keg with over 9 liters (2.38 gallons) of beer and 26 bottles of 33 cl (12 oz) carbonated to 2.3 volumes of CO2 of our first NEIPA. This NEIPA will be entered in the IPA Day competition with our American IPA, bottled yesterday. In a future post we will tell you how the judges treated both beers. Until then, thank you very much for visiting and if you want to stay updated with our blog, don’t forget to follow us on WordPress or our Facebook page. 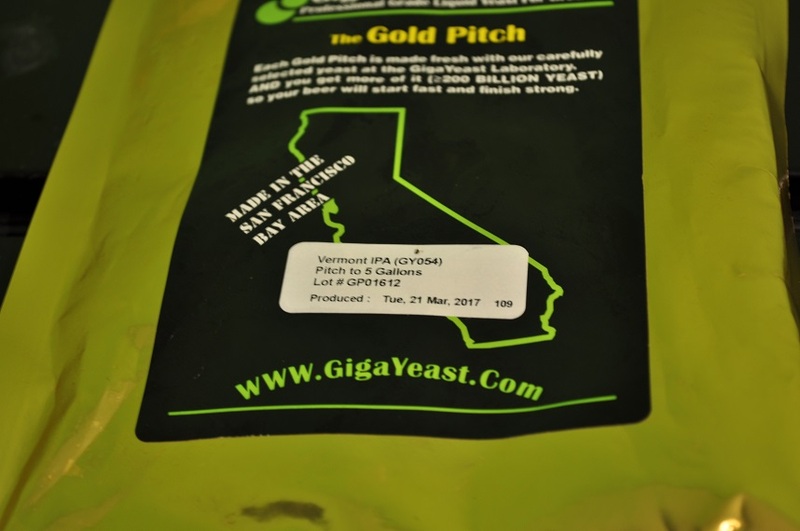 This entry was posted in Elaboration and tagged dry hopping, Elaboration, Giga Yeast, Iberian cup 2017, IPA Day, NEIPA, recipes, Vermont IPA, water. Bookmark the permalink.